Azure Active Directory provides you with a variety of reports, containing useful information for applications such as SIEM systems, audit, and business intelligence tools. By using the Microsoft Graph API for Azure AD reports, you can gain programmatic access to the data through a set of REST-based APIs. You can call these APIs from a variety of programming languages and tools. This article provides you with an overview of the reporting API, including ways to access it. If you run into issues, see how to get support for Azure Active Directory. For detailed instructions, see the prerequisites to access the Azure Active Directory reporting API. The Microsoft Graph API endpoint for audit logs is https://graph.microsoft.com/beta/auditLogs/directoryAudits and the Microsoft Graph API endpoint for sign-ins is https://graph.microsoft.com/beta/auditLogs/signIns. For more information, see the audit API reference and sign-in API reference. In addition, you can use the Identity Protection risk events API to gain programmatic access to security detections using Microsoft Graph. For more information, see Get started with Azure Active Directory Identity Protection and Microsoft Graph. The https://graph.windows.net/<tenant-name>/reports/ endpoint is deprecated. Use the new API endpoints described above to programmatically access the activity and security reports. You can use the MSGraph explorer to verify your sign-in and audit API data. 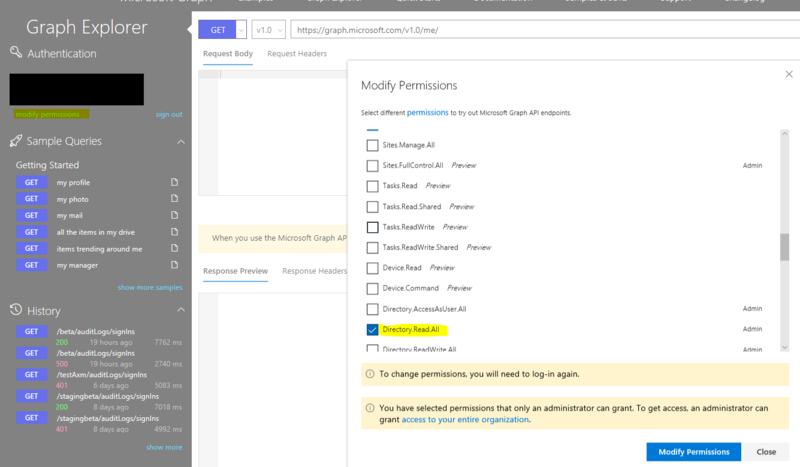 Make sure to sign in to your account using both of the sign-in buttons in the Graph Explorer UI, and set AuditLog.Read.All and Directory.Read.All permissions for your tenant as shown. Use the Azure AD Reporting API with certificates if you plan to retrieve reporting data without user intervention. 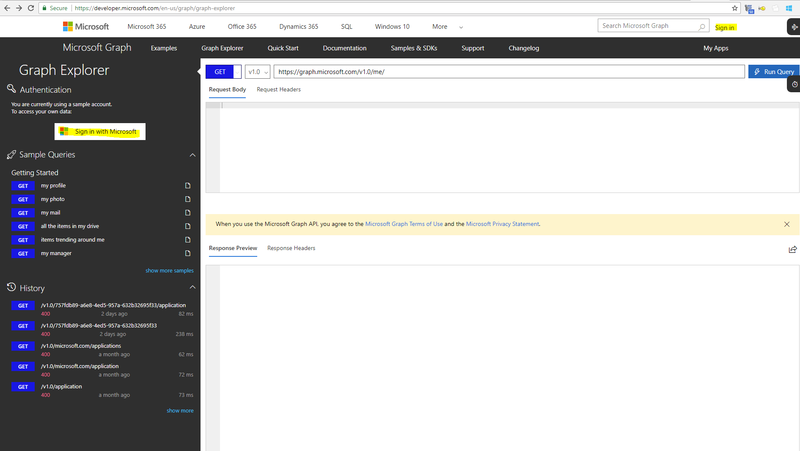 For detailed instructions, see Get data using the Azure AD Reporting API with certificates. Tista’ wkoll tħalli l-feedback direttament fuq GitHub .